Commissioned from the celebrated American sculptor Augustus Saint-Gaudens in the early 1880s and dedicated as a monument in 1897, the Shaw Memorial has been acclaimed as the greatest American sculpture of the 19th century. The memorial commemorates the valiant efforts of Colonel Robert Gould Shaw and the men of the 54th Massachusetts, the first Civil War regiment of African Americans enlisted in the North. The 54th Massachusetts Volunteer Infantry was raised shortly after Lincoln’s issuance of the Emancipation Proclamation on January 1, 1863. Recruits came from many states, encouraged by such African American leaders as the great orator Frederick Douglass, whose own sons joined the 54th. The unit was commanded by 25-year-old Robert Gould Shaw, the Harvard-educated son of dedicated white abolitionists. On the evening of July 18, 1863, the 54th Massachusetts led the assault upon the nearly impenetrable earthworks of Fort Wagner, which guarded access to the port of Charleston, South Carolina. Shaw, at the front of the charge, was one of the first to die. Of the approximately 600 men of the 54th who participated, nearly 300 were captured, declared missing, or died from wounds they received that day. The steadfastness and bravery of the 54th were widely reported, providing a powerful rallying point for African Americans who had longed for the chance to fight for the emancipation of their race. By the end of the war, African Americans composed 10 percent of the Union forces, contributing crucial manpower to the final victory of the North. Augustus Saint-Gaudens was born in Dublin in 1848 and raised in New York, where he was apprenticed to a cameo-cutter at the age of 13. After a period of study in Paris in the 1860s, he began his career in Rome with several commissions for sculpted portraits. In post–Civil War America, the unprecedented interest in creating public monuments to the nation’s heroes brought Saint-Gaudens many commissions. The sculptor’s ability to combine startling naturalism with lofty allegory made his work eminently suited to such endeavors. The Shaw Memorial, first imagined by the artist as a traditional equestrian monument to a single heroic figure, evolved into a more original and challenging project as the artist added a narrative relief to commemorate the troops as well as their leader. Although the sculptor’s contract called for the work to be completed in two years, it took Saint-Gaudens more than a decade to complete the monument, which kept evolving and growing in complexity, becoming as he said "a labor of love." Even as the Shaw Memorial was being cast in bronze before its unveiling on Boston Common in May 1897, Saint-Gaudens was working on yet another version of the subject. This slightly different design, cast in plaster (and exhibited here), reflects subtle changes that the sculptor made as he refined the sculpture into his final vision prior to its exhibition in Paris in 1898 and 1900. In 1901, the plaster traveled to the Pan-American Exposition and was purchased the following year by the Buffalo Fine Arts Academy (later the Albright-Knox Art Gallery). Presented by that museum to the Saint-Gaudens National Historic Site in 1949, it was exhibited there for several decades. As part of an extensive conservation and casting project, this plaster version of Saint-Gaudens’ timeless masterpiece came to the National Gallery of Art on long-term loan in 1997. 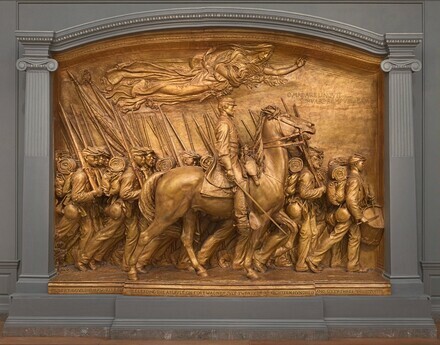 Augustus Saint-Gaudens' Memorial to Robert Gould Shaw and the Massachusetts Fifty-fourth Regiment, National Gallery of Art, Washington, 1997-1998. Tell It with Pride: The 54th Massachusetts Regiment and Augustus Saint-Gaudens’ Shaw Memorial, National Gallery of Art, Washington, 2013 - 2014, no. 65. Soo Hoo, Winyan. "Important Piece of The City's Art Puzzle." Washington Post 139, no. 97 (March 11, 2016): 19, color repro.